Record the location of a macro definition. Definition at line 148 of file PreprocessingRecord.h. Definition at line 153 of file PreprocessingRecord.h. Definition at line 164 of file PreprocessingRecord.h. Retrieve the location of the macro name in the definition. Definition at line 161 of file PreprocessingRecord.h. 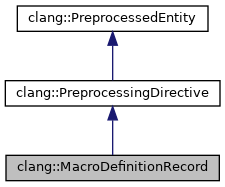 Retrieve the name of the macro being defined. Definition at line 158 of file PreprocessingRecord.h.